Are you ready to incorporate project-based learning into your curriculum? This rubric will help you grade ANY extension project fairly, no matter what the project is! This gives students ultimate autonomy because they can choose any project they want, but they will all be graded based on the same general requirement. 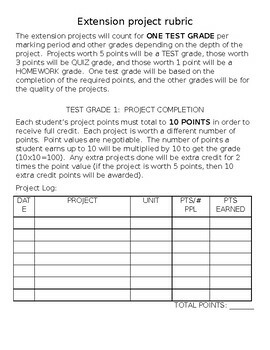 I've set up two different categories so that students are kept on-task, and their individual projects are being graded. Are they working in groups? I've made adjustments for that, too! This can be used for extension projects in ANY subject.